The western state of India, Gujarat, is famous for its infinite varieties of snacking items and tasty vegetarian dishes. 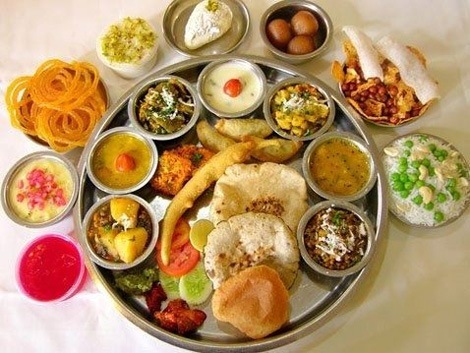 Majority of communities in Gujarat are vegetarians, influenced by Jainism, and Gaujarati vegetarian curries (‘Shaak’) dominate in their famous ‘Thali’ – the celebrative meal plate from Gujarat. The cuisine is influenced by their colourful culture and festivals – exotic, flavoursome and variety. Not too hot, not too bland, but spices are nicely balanced by marrying the tastes with sweetness. Exotic spices are tamed by a hint of sweet taste – adding jaggery or sugar to Gujarati dishes. The sweetness in their curries actually invites and inspires the curry lovers – specially the ‘new-to-curry’ types. While the ‘curry’ is called ‘Kaari’ or ‘Koora’ in South India, it is known as ‘Shaak’ or ‘Sabji’ in general in North India, particularly in Gujarat. Besan flour (Chickpea flour), mustard seeds, sesame seeds, yogurt, lime and sweeteners like jaggery or sugar dominates many snacking recipes – like Dhokla, Khandvi, Khadi, etc. Gujarati community is one of the most established and populated communities in the UK. Leicester and some parts of London City are home of Gujarati communities and Gujarati dishes are widely available to taste here in the UK. To tickle your taste buds with nice and mild curries of Gujarat, you gotta try these recipes!